While we applaud LG for trying something innovative, this may be a case of too much, too soon. However, if you don’t have the desktop space for two full monitors, the 29EA93 may serve well as a normal desktop display. LG’s 29EA93 monitor offers a 29-inch diagonal screen size, which seems big. But that number is deceptive since the panel is also barely 12 inches high. This is one of those newfangled, ultra-widescreen monitors, sporting a pixel resolution of 2560 x 1080 and an aspect ratio of 21:9. Why build such a skinny, extremely wide display? One audience would be hard-core movie buffs, interested in watching movies with either minimal or no letterboxing. Another audience might be users without the desk space for two physical monitors, but who want to view two documents side-by-side. However, the 29EA93 is 27.6 inches wide, which still eats up considerable desk space. 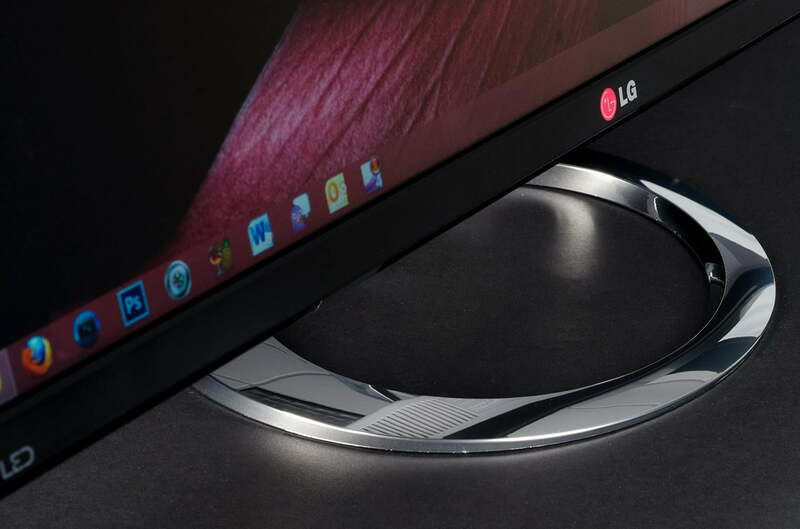 LG does offer some amenities to take advantage of the ultra-widescreen nature of the display. The hardware controls support splitting the screen between inputs, so you can show two sources simultaneously. LG also includes software to more easily manage Windows. The 29EA3 supports USB 3.0, and can act as a USB hub. However, it’s still tough to get past that skinny, wide aspect ratio. It’s striking, but seems very much like a niche product. Before we pass judgment, though, let’s take a closer look. At first, blush, the 2560 x 1080 pixel resolution seems like a lot of pixels compared to standard 1080p, 16:9 monitors with 1920 x 1080 pixels. However, the 29-inch diagonal size translates to a pixel density just shy of 96 dpi – roughly the same pixel density as a 23-inch diagonal 1080p monitor, which is pretty much the default size these days. …the LG 29EA93 offers very good contrast ratios and tracks color temperatures well, but it isn’t always faithful to the colors displayed. The 29EA93 supports a plethora of inputs: DVI dual link, DisplayPort 1.2, and two, count ‘em, two HDMI inputs. The second HDMI input is specifically to support MHL (mobile high-definition link) interfaces from smart phones and similar devices. LG thoughtfully provides a MHL micro-HDMI-to-HDMI adapter cable just for that purpose. Notably missing is a VGA port, but that’s no big loss as far as we’re concerned. Also included is a DVI dual link cable, USB 3.0 cable, and audio adapter cable with male mini-jacks on both ends. Stereo speakers are built into the display. These speakers sound terrible. Music and movie content sounds muddy and muffled. 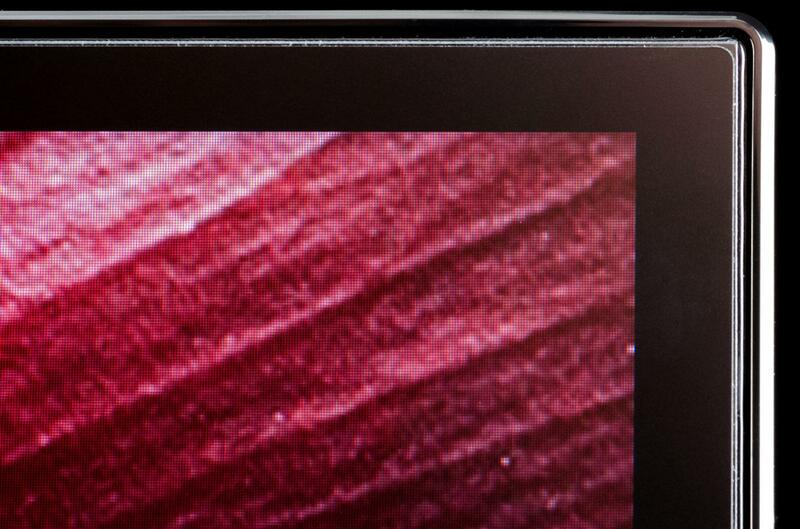 We suggest using headphones connected to the audio pass-through on the rear of the display. Better yet, use good desktop speakers. LG rates the brightness at up to 300 cd/m2 and the contrast ratio at a somewhat ridiculous 5,000,000:1. Response time is rated at 5ms, which is excellent for an IPS display. The monitor has a subtle anti-glare coating, so isn’t overly shiny or reflective in a lit room. 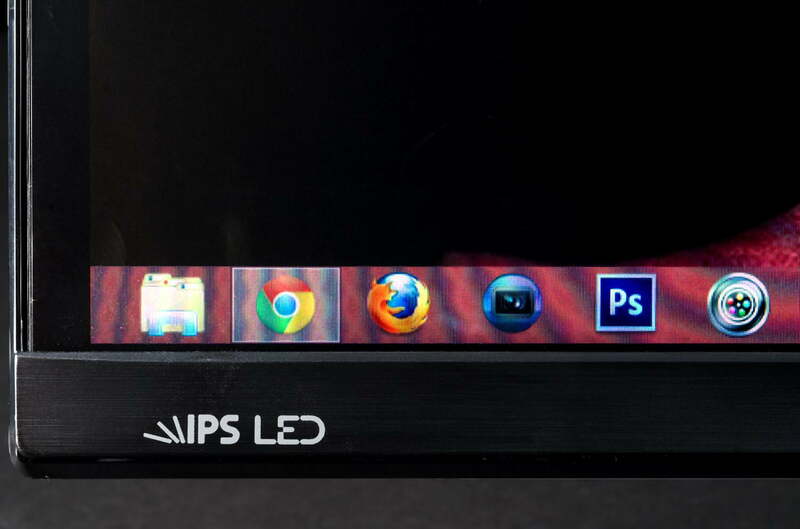 Like most IPS panels, the 29EA93 is rated at a full 8 bits per pixel color depth, or 16 million colors. The maximum refresh rate is 75Hz. 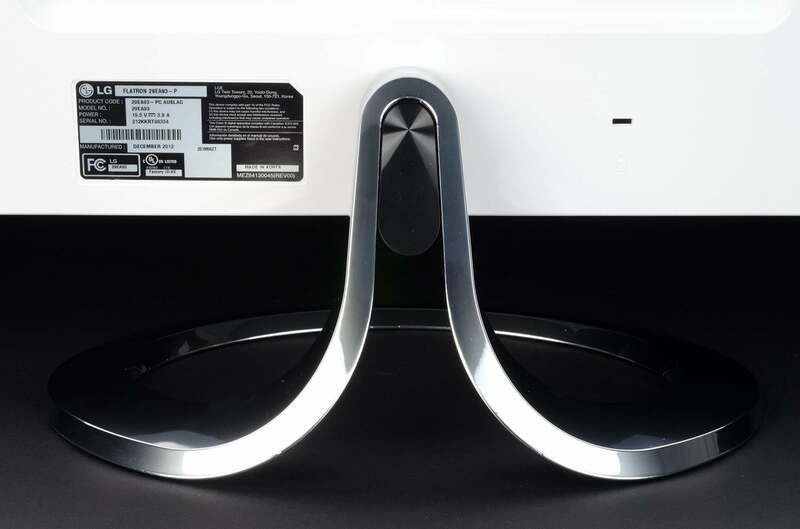 Monitor settings are made via touch-sensitive controls under the lower right bezel. Just touching the “<” and “>” adjusts the audio volume. You need to activate the menus to control actual display settings. LG supplies a rich array of tweaking options; you can go with standardized settings like “Cinema” or “Game,” but you can also calibrate to your heart’s content with individual controls for each color settings, multiple gamma tweaks, and manual color temperature controls. The controls are a nuisance to navigate, however. With only four buttons and multiple menu layers, you’re constantly having to switch back and forth between different buttons, and it’s all too easy to brush the wrong control, ending up either in a completely different menu than you wanted or closing the menu altogether. The numerous controls, which allow you to tweak every possible display setting, cry out for a dedicated remote control. The monitor stand is basic. The only adjustment available is tilt, so if you need height adjustment, you’ll need to either invest in a third party stand or stack something under the stand. The stand is actually very short, so the display sits pretty low. You’ll find yourself either tilting the monitor back a substantial amount or elevating it with some books or something similar. You’ll find the stand attractive if you’re into the faux chrome plated, minimalist look. We calibrated the display using Spyder 4 Elite. The measured color gamut is 100 percent of SRGB and 80 percent of Adobe RGB. This makes the display excellent for most consumer applications like video and gaming. It’s adequate for light duty photo editing, but professional photographers may want a display with an even wider gamut. However, pro photographers would probably steer away from the oddball aspect ratio anyway. Once calibrated, we dove into our array of tests. The 200 cd/m2 output level is just a little over the 50 percent setting for the brightness control, which is about the right brightness level for our workspace. With the control set to 100 percent, the measured brightness is 274 cd/m2, not far off the rated 300 cd/m2. The contrast ratio at the 50 percent brightness setting is a very good 540:1, but it’s certainly not 5,000,000:1! After setting the monitor to 6500K, we noticed that the display tracked the 6500K setting through all gray levels with reasonable accuracy, dipping as low as 6300K and as high as 6600K. Measured color accuracy was fairly poor, however. On the other hand, color uniformity and brightness uniformity weren’t bad. There were no serious hotspots, and the measured difference was 10 percent or less in any one quadrant. When viewing video, photographs, and gaming content, the colors and contrast appeared better to the eye than the numbers might indicate. Part of this may be due to the coarseness of the measurements. Our test methodology divides the display into nine sections, but the extremely wide nature of this display meant each test section was larger than normal. Overall, in terms of performance, the LG 29EA93 offers very good contrast ratios, and tracks color temperatures well, but it isn’t always faithful to the colors displayed. Additional calibration fine-tuning might improve color tracking, however. Given the extreme aspect ratio and the overall odd shape, it’s worth discussing our experiences with actually using the monitor. 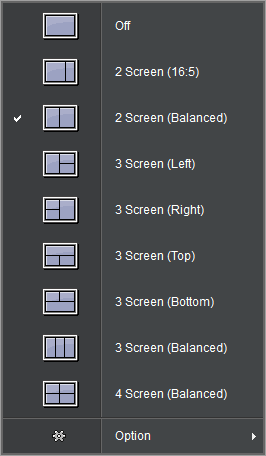 Screen Split allows you to pick a variety of window layouts. LG supplies a nifty utility called Screen Split that auto places windows as you open them. You can configure window placement ranging from two to four different windows. Screen Split is a handy utility, particularly if you don’t open dozens of windows. However, we ran into interesting problems with gaming and movie viewing. One of the potential audiences for 21:9 aspect ratio displays are film buffs who want to watch 2.35:1 widescreen movies without letterboxes. Unfortunately, this doesn’t work so well in practice. We used Arcsoft’s Total Media Theater to check out several movies, including the Blu-ray versions of Star Trek and 2001: A Space Odyssey. The movies didn’t scale well to the higher resolution and aspect ratio. When stretched to fill the screen using the display’s built-in scaling controls, even the very wide screen 2001 looked odd. You can set the auto-tiling feature for up to four windows. Some games won’t recognize the resolution either. For example, we could never get Mass Effect 3 to run at full 2560 x 1080 resolution, even when we tried fixes that other users suggested at Wide Screen Gaming Forum. Bioshock: Infinite experienced similar issues. This was a little surprising, since the Nvidia GTX 680 card we use in our test system supports a variety of aspect ratios and can handle stretching some games over multiple displays. If the 21:9 aspect ratio becomes more common, we’ll likely see these problems become a thing of the past, but for now, be aware that you may not get a full 21:9 gaming experience. Bear in mind that we didn’t have the luxury of time to fully tweak all possible settings. If you’re patient and willing to scour the Internet for solutions, you may have a better experience. But people expecting the glories of 21:9 running out-of-the-box may be disappointed. The LG 29EA93 measures fairly well post calibration, so LG did a reasonably good job on the electronics side. However, while a 21:9 aspect ratio offering 2560 x 1080 resolution sounds like an exciting concept, it’s really a solution in search of a problem. Blu-ray and Internet streaming movie services aren’t really set up to deliver 21:9 movies, so you need to rely on the scaling or stretching capability of either the display or the playback software. Games are another mixed bag, and many games will likely require some tweaking and fixes in order to run full resolution. The issues may be different with different graphics cards as well. The LG 29EA93 is conceptually a fascinating display. While we applaud LG for trying something innovative, this may be a case of too much, too soon. However, if you don’t have the desktop space for two full monitors, the 29EA93 may serve well as a normal desktop display. But see if you can take a look at one before you buy.